Posted on Friday, February 7th, 2014 at 6:55 am by Pieter van der Westhuizen. 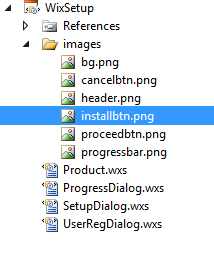 The WiX toolset provides a number of built-in dialogs that should be adequate for most installers. 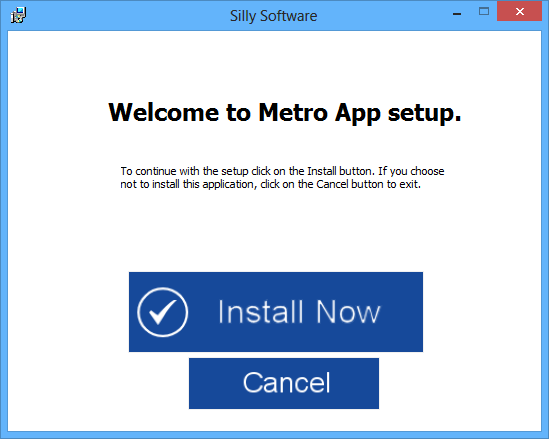 If, however, you need more flexibility when it comes to your MSI installer’s user interface, WiX provides the ability to build a custom UI of your setup project. In this article, we’ll build a custom WiX setup project that will use the modern/metro style look and feel. When the user clicks on the “Install Now” button, they will be prompted to enter their full name and email address. Notice, the UIRef, Binary, Property and Custom Action elements. 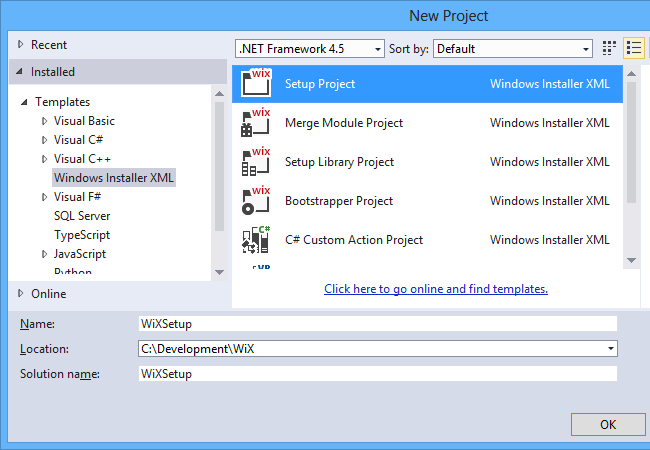 Next, we need to add a new WiX Installer File to the project. This file will be used to create the first dialog in the setup process. We’ll use this image for a button that the user will have to click to start the installation process. Next, we specify the fonts that our custom dialog will use by adding two TextStyle elements. The Dialog element is used to “build” your UI. The Height and Width attributes are required and are used to set the size of the dialog. The mark-up is pretty straight forward, but the most import bit which we’ll need to pay attention to is the proceedButton Control element. You’ll notice it contains a child Publish element whose Event attribute is set to DoAction and its Value attribute is set to the Id of the CustomAction element further down in the file. This will cause the custom action to execute as soon as the user clicks the Proceed button on the UI. The custom action will use the emailTextbox and nameTexbox control elements’ Property attribute values to save the information the user entered. 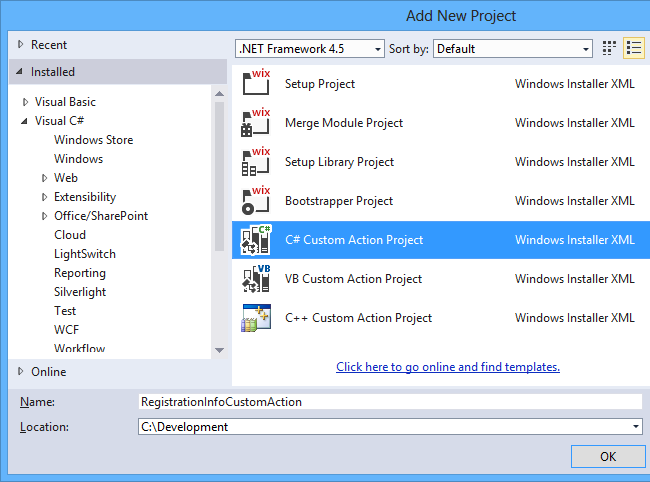 You can now build your setup project and will see a registrattioninfo.txt file in the C:Users<username>AppDataRoamingWin App folder after installation has completed. Are you having trouble compiling the sample project? Where did you get the images???? so where did you place the properties defined in the ‘Edit’ controls?. I always got an error when i try to implement the ‘Edit’ controls. but I’m still not sure how that links the customaction to the control event. Any clarification would be appreciated. Thanks! To link the custom action, you’ll need to add a reference to it in your Wix project by right-clicking on the References and selecting Add Reference. From tehre click on the Projects tab and choose your custom action project. Could you please provide a simple example of how to add the final ExitDialog? I’m still not able to achieve it, thanks a lot. That dialog is a special one. It is added automatically when you add any standard dialogs. It is absent in the dialog tree because it may be shown at different moments under different conditions, say, when your installer fails. If you need to customize it, please see e.g. http://www.dizzymonkeydesign.com/blog/misc/adding-and-customizing-dlgs-in-wix-3/. Thanks for your answer. Maybe we misunderstood, in fact, I need to add the 4th dialog, shown after the Progress Dialog, with the message “Installation was successful” and the Finish button. Oh, it appears I responded assuming you are using pure WiX. Now I suppose that you use the WiX Designer. If so, right-click the setup project, choose User Interface Editor in the context menu. In the UI editor, expand the entry End (under the Install node) and make sure there’s a node called Finished below it. If you think I still respond in a wrong way, please provide more details about what you do. I just can’t imagine why would you need to add that dialog. Isn’t it already added? Does it show up if you start the installer? yes, I use the pure WiX and the steps according to this article, I don’t use the WiX Designer. I need to inform an user, that installation completed successfully. That is why I need to add the last dialog with the “successful” message. I don’t know how to add the 4th dialog in my source code. When I start the installer, then nothing is shown after the “Progress Dialog”. Is that more clear now? Well, yes, it is more clear. Still, I don’t understand how you’ve added the other three dialogs. At http://wixtoolset.org/documentation/manual/v3/wixui/wixui_dialog_library.html they describe using dialog sets supported by WiX. Note that all dialog sets on that page show ExitDlg. At http://wixtoolset.org/documentation/manual/v3/wixui/wixui_customizations.html they describe how to customize the dialog sets; also this page shows how to customize ExitDlg. I’m sorry Andrei. I think you don’t answer to this article. But still thank you for your time. Please try this. I can send a complete sample if you wish. Some more clarity is needed !! Please specify exactly what part(s) requires clarification. How did you change the progress bar’s colour to blue? As i see the code of progress dialog, there is no special effort to achieve that. I assume the color of the progress bar is taken from the Windows color scheme. According to the links below, you can’t control the color of that control. Am very new to this WiX setup project. In this project am unable see the ProgressDialog.wxs file. I’ve downloaded the solution above. I can build it in VS 2015 with no issues. 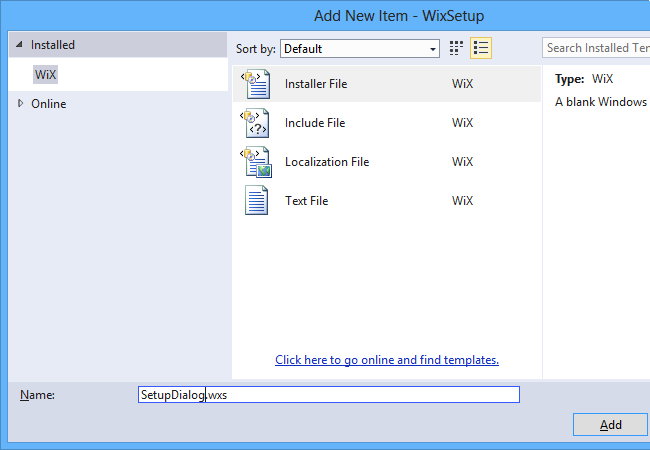 ProgressDialog.wxs is listed under the setup project node in Solution Explorer. ‘Microsoft.Tools.WindowsInstallerXml.AssemblyDeafuaultWixExtensionAttribute’ was not defined in the assembly or the type definition in extension ‘..RegistrationInfoCustomAction\bin\Debug\RegistrationInfoCustomActiom.dll’ could noit be loaded. ‘WindowsInstallerXml.AssemblyDefaultWixExtensionAttribute was not defined in the assembly’. ” ‘Either Microsoft.Tools.WindowsInstallerXml.AssemblyDefaultWixExtensionAttribute’ was not defined in the assembly or the type defined in extension ‘..\RegistrationInfoCustomAction\bin\Debug\RegistrationInfoCustomAction.dll’ coult not be loaded “. What is the reason for this error. I cannot reproduce this issue. I suggest that you google for the error message that you get. How can I do all this with MFC dialogs? WiX dialogs are actually XML constructs providing data for the interpreter: Microsoft Installer works behind any MSI installer. The only place for you to show a custom non-MSI dialog is a custom action executable. where is the text file save? pls provide steps to find text file in system. I suggest that you check the sample project’s files. I have a text file called as test.txt,so i want to show text file data into textfield area in dialog during installation process or on before install. pls help me,how can i do? Check how the licens is shown. “the installer has encountered an unexpected error installing this package this may indicate a problem with this package.error code is 2819″. We can provide such help only as part of our support services. If you have an active Add-in Express subscription, please send me information relating to this issue to the support email address; see the contact form at https://www.add-in-express.com/support/askus.php. Hi, how to check EMAIL and FULLNAME Property? if email, or fullname is empty then show dialog show message error ? I suggest that you google for those properties as I don’t know them. As to showing the message I suggest that you google for how to check built-in and custom properties in WiX. I’ve downloaded the app and built it through vs but when I try build my own project I’m getting some errors that are hard to understand on google. error LGHT0204: ICE20: FatalError dialog/action not found in ‘InstallUISequence’ Sequence Table. error LGHT0204: ICE20: FatalError dialog/action not found in ‘AdminUISequence’ Sequence Table. error LGHT0204: ICE20: UserExit dialog/action not found in ‘InstallUISequence’ Sequence Table. error LGHT0204: ICE20: UserExit dialog/action not found in ‘AdminUISequence’ Sequence Table. error LGHT0204: ICE20: Exit dialog/action not found in ‘InstallUISequence’ Sequence Table. error LGHT0204: ICE20: Exit dialog/action not found in ‘AdminUISequence’ Sequence Table. Not sure why it’s happening to my own project when not happening on the project that I downloaded. The project is almost identical. I was able to figure out the problem for the ICE20 but now I am unable to install because the custom action dll is having an issue, anyone else get this issue? I suggest that you use Google or any other search engine supplying it with the text of the error message that you receive.